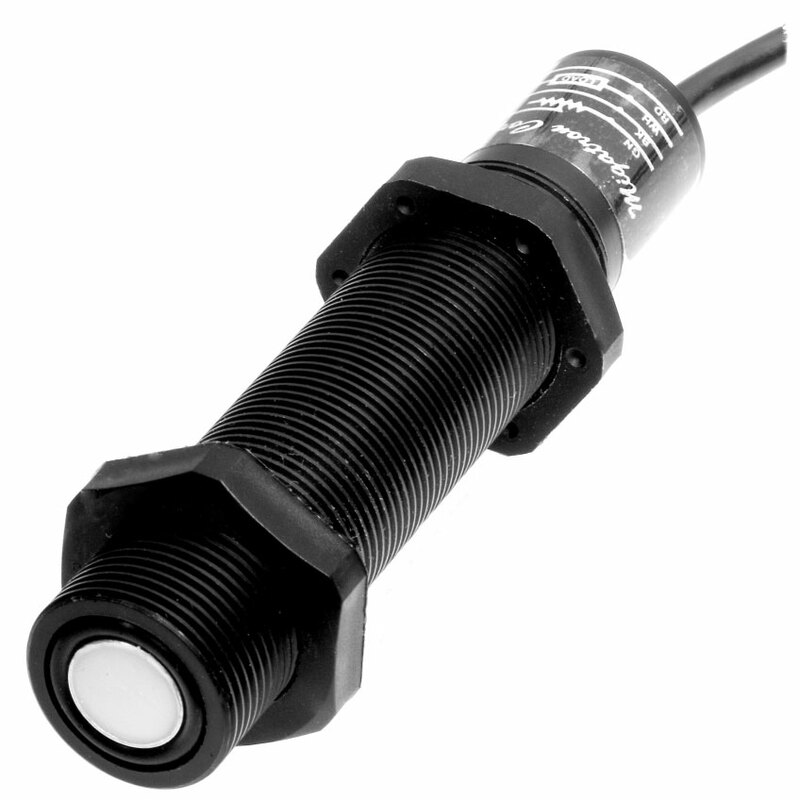 The RPS-400-30 has a 22mm barrel housing, completely self -contained, 12-30VDC powered ultrasonic proximity sensor. A sealed transducer provides protection in environments where dirt and moisture are a problem. The sensor is constructed of Delrinplastic with a silicone rubber sensing face. This sensor is range or distance sensitive, enabling the sensor to detect objects within the desired range, and reject objects outside the desired range. The RPS-400-30 is a solid state sensor and has an NPN open collector transistor output. for initial setup purposes, a built in LED indicator illuminates when the ultrasonic waveform is reflected back to the unit within the preset range. The sensing range is fixed at less than 5in. by connecting the green lead to the black lead of the cable; or adjustable up to 30in. by connecting a resistor/potentiometer between the green and black leads. The resistor chart on our catalog sheet PDF provides resistor values and approximate resulting sensing ranges. The ultrasonic sensor can be used as a proximity sensor or level sensor. It is equally effective on liquid, metal, plastic and glass targets regardless of color, density, or transparency. Standard 6ft. cable is provided. Optional cable lines are available. Proximity detection is the detection of an object in a given range. That detection range of the RPS-400-30 can be controlled by a resistor or potentiometer wired to the green and black leads of the unit, and is adjustable to the desired detect distance. Any object within the desired range is detected, while objects outside the desired range are ignored. The detect point is independent of size, material, or reflectivity. The proximity option is denoted by the part number RPS-400-30. The RPS-400-30 can be furnished with Hysteresis Control capability. The Hysteresis sensor has a fixed detect point equal to the sensors minimum range and an adjustable turn off point up to the sensors maximum range. Simply stated, an object will be detected at the minimum range, and will remain detected until the object is no longer within the adjustable turn off point. (See figure above). the Hysteresis option is denoted by the part number RPS-400H-30.